A member from North Carolina recently was convicted of a DUI. His story is all too familiar: A 40-year safe driving record with no tickets, lost his job because of the DUI, dealing with the cost/hassle of an ignition interlock on his car, restricted to work-related driving and, after losing auto insurance coverage, forced into a state-run insurance program at triple premium cost. Note that this does not include multiple days of lost work to appear in court or, as in the case of our NC member, a lost job. It also does not reflect insurance rates that for several years will be through the roof. Keep this in mind the next time – and there always is a next time – there is a national call to lower the DUI/DWI limit from 0.08 to 0.05 BAC. Remember this the next time you have a beer or two after work, or a couple of glasses of wine at a friendly gathering, before heading home. You could be in perfect control of your faculties and of your vehicle. But let’s say you are stopped at a traffic light and get clipped from behind through no fault of your own. Woe be to you if the police are called to file a report , insist on sobriety checks all around, and you blow a 0.08 or higher. You have just become part of an alcohol-related accident (even though alcohol was not a primary factor or even secondary cause) and you’ll quickly find out what being a DUI outcast is all about. 1. Sell your nice car and buy a beater. Put absolute minimum insurance coverage on it. Mark your calendar and when you pass the punishment date, sell the jalopy and buy a nice car again. This is a fairly common (and still costly) workaround. 2. Sell the car and don’t drive for the punishment period, usually a year or more. Use public transportation (if you happen to live in a place where that is possible) or Uber everywhere you go. The advantage here is the avoidance of all associated ignition interlock device charges and, at least in the short term, skyrocketing auto insurance premiums. 3. 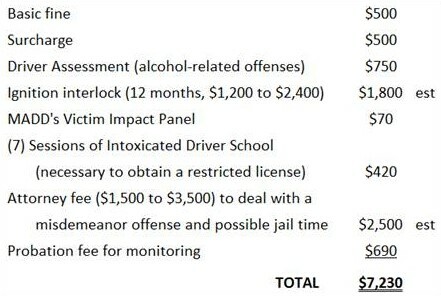 Pay through the nose, rewarding and perpetuating the DUI apparatus. Notice that the emphasis is on punishment (and money collection) rather than treatment. If anything, a person with a drinking problem is subjected to additional stressors that can easily accelerate the path to self destruction. For the NMA perspective on how DUI/DWI cases should be dealt with, click here.